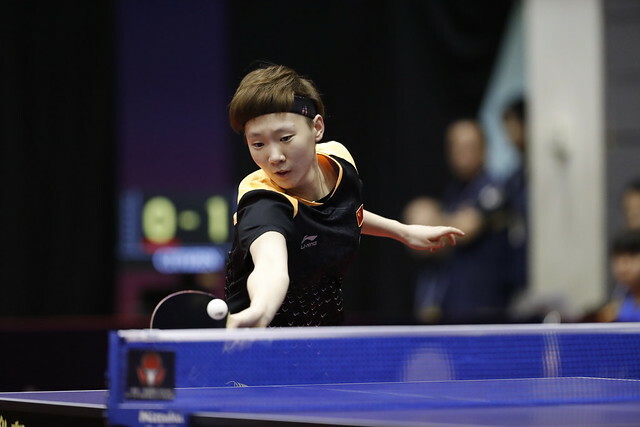 A place in the second round secured but for the local girl from Kitakyushu, Hina Hayata, there was to be no place in the quarter-final stage of the Women’s Singles event at the Seamaster 2018 ITTF World Tour Lion Japan Open. The no.12 seed, on the morning of Saturday 9th June, she was beaten by China’s Mu Zi (12-10, 6-11, 9-11, 11-5, 11-8, 11-7). Defeat but it could not be considered an upset when the history of Mu Zi is taken into consideration. Notably, she was a semi-finalist at the Qoros 2015 World Championships and later in the same year the winner on the ITTF World Tour in Sweden. Success for China in the second round of the Women’s Singles event and there was further success; ever more consistent, Wang Manyu, the no.2 seed, accounted for Hong Kong’s Lee Ho Ching, the no.14 seed (11-6, 11-7, 11-6, 7-11, 11-9). Meanwhile, for Japan, despite defeat for Hina Hayata there was success. Mima Ito, the no.3 seed, beat Korea Republic’s Suh Hyowon, the no.11 seed (11-7, 11-7, 11-2, 11-4) and thus repeated the success she had enjoyed in 2017 when in Wuxi they had met at the Asian Championships; Kasumi Ishikawa, the top seed, accounted for Romania’s Bernadette Szocs, a player who had been required to compete in the qualification tournament. Kasumi Ishikawa emerged successful in five games (11-6, 11-9, 4-11, 11-1, 11-7). At the quarter-final stage Kasumi Ishikawa meets China’s Chen Xingtong, Mima Ito opposes Chinese Taipei’s Cheng I-Ching. In the opposite half of the draw Mu Zi plays Wang Manyu, the host nation’s Miu Hirano confronts China’s Liu Shiwen.